It’s rare to get excited over haggling for a better salary. Negotiating a new salary or a pay raise is nerve-wracking and uncomfortable. But it’s common before accepting a new job or position. And it’s okay to ask for better pay in your current position, if your performance warrants it. But you can’t go in unprepared. Know what the market can bear and what your contributions bring to the bottom line. Use these dos and don’ts to help you get the salary you deserve for your new position or raise. Did you negotiate your offer, or just accept it as is? Negotiation isn’t learned in school, making asking for what you want difficult. But did you know you’re expected to negotiate? Employers aim low, hoping to get the best deal possible. And statistics are on their side that there will be little-to-no negotiation. They’ve given you an offer, but is it their final and best one? Probably not. Just ask. Swallow your nerves, and ask for what you want. And be enthusiastic about it, too. If you’re negotiating your starting salary, say you really want to accept the position, but the starting salary is a concern. State what you would need to accept the position and be precise. But what about negotiating a raise? The best time to ask is during a performance review, or shortly after (as long as it was a positive one). Many times, this is when cost of living increases are awarded. If you’re aiming for more, come prepared as to why you deserve more for your efforts. It’s tough. They’re going to ask for your number first, and you’ll want to be agreeable. But sharing it can hurt you in the end. Instead, try to get the employer to tell you their salary range for the position. If your requirements fall within this spectrum, that’s great. But stay quiet with your number. Here’s why: a recruiter mentions that the pay range for a job is between $40,000 and $50,000. Your requirement is $42,000. If you mention this, and get an offer, it will likely be for $40,000 – $42,000, or less. After all, that’s what you’re looking for, right? By not disclosing your number, the employer doesn’t know what it will take to get you. They may still make you a $40,000 offer, but you have more room to negotiate. Since they’re not aware of your number, they’re more likely to offer something higher. It may not seem like much up front, but over the course of your employment, this will compound. Turn the question around when you’re asked. For example, you can say, “Based on the research I’ve done for the position, industry, and location, coupled with my skill set and qualifications, I’ve determined a fair range for this position is between X and X. Would you say this position falls within that range?” Now it’s up to them to disclose their range and whether it’s within those means. Your number remains safe. Not only does your salary increase over time, but it compounds. Say for instance you negotiated a salary of $45,000 annually with a two percent bonus each year. Your co-worker signed the first number given to her, $40,000, with a two percent bonus each year. You and your co-worker are equal performers. You both earn identical performance reviews each year and a 3.5 percent raise. It doesn’t seem like much at first, but after five years that’s $27,348.58. Now imagine that over the course of your career – yikes! 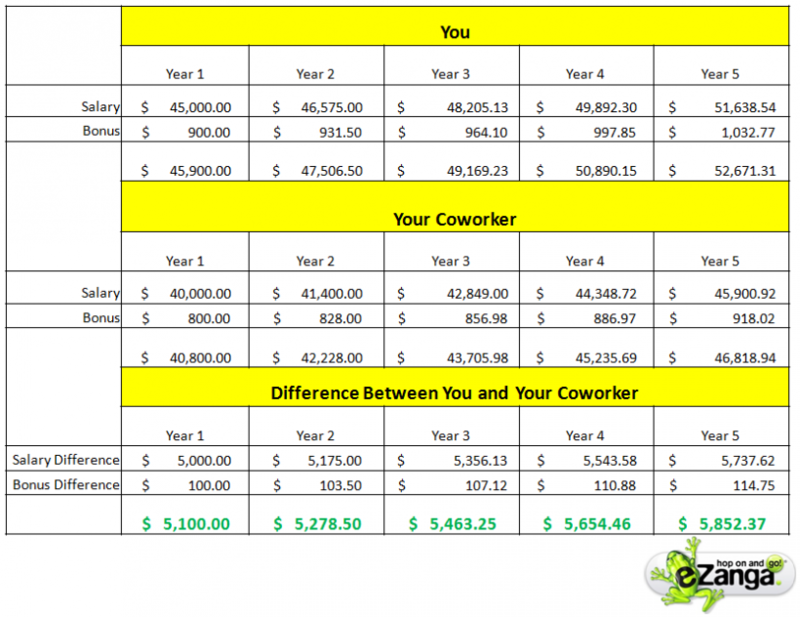 Compounding can make a big difference in your future salary negotiations, too. Try not to leave money on the table. If you must, leverage it with other non-salary options. Again, just ask. Prepare to negotiate to ensure you can achieve your long-term salary aspirations. There are assets other than your salary that you can leverage. Non-salary options make up your compensation package, too. Look at increasing your benefits package with more vacation time or increased flexibility. For a new position or a tenured employee, ask about extra vacation time. If you’re a tenured, trusted employee, inquire about telecommuting a few days a week to avoid your commute and save money. Maybe telecommuting isn’t an option, but is flex-time? Would your employer allow you to work four 10-hour days versus five 8-hour days? And don’t forget about extras like health care. For example, I recently moved from a mid-size business to a small family-owned business. Health care is expensive to provide, and I didn’t need it (I have it through my spouses’ employer). I asked to have what they would have spent on my health care reinvested into my salary, and they did. Now, I wouldn’t condone this for everyone (please, seriously, you need health care). But if you’re in the position to leverage it, go for it. Salary ranges for positions are just that: ranges. Some employers will pay on the higher end for more experienced employees. Be real with yourself when making your requests. A person with 15 years of experience will have skills and attributes that a recent grad won’t. It makes a difference. And the salary range might be higher, or lower, depending on the job title and even the location of the position. When looking up salary ranges for a specific position, filter by location. For example, a media buyer in Philadelphia shouldn’t focus on what media buyers make in New York City. It’ll skew your salary range. As a bonus: do you know what similar positions at competing agencies make? If so, use that to your advantage. Also, is there a difference between an Associate Media Buyer and a Senior Media Buyer? Sure, it’s years of project scope and increased responsibility. The experience required and perceived value for each position may be different. Those differences likely make up two different pay scales, too. Don’t conduct your salary research based only on titles, either. Look at the description of each position and its relevance to yours. A ‘Senior Media Buyer’ at one company may be equivalent to an ‘Associate Media Buyer’ at another. Research the position’s responsibilities, not just the title. Sometimes it just isn’t meant to be, and that’s okay too. Hearing ‘no’ now doesn’t mean you’re forever shut down, but now just isn’t good time to honor your request. If you’re a current employee looking for a raise, your battle isn’t over. Swallow back your emotions and try again later. Try looking for a time when your request is more likely to acknowledged: annual reviews, a big win on a project, a successful company quarter, or meeting a major achievement, are all good times to ask. But stay away from tax season, making requests when the team isn’t hitting projections, or after a project didn’t meet expectations. Are they typically unwilling to negotiate employment conditions? Is your request outside of the scope of reality? Is the current unwillingness to negotiate going to hinder your future growth and development? A ‘yes’ to any of these questions means you need to decide for yourself if this is a standard you’re willing to accept, or if you’re willing to be more flexible in your decision. Salary negotiations are tough, even for the savviest of negotiators, because it’s your livelihood on the line. Come to the table armed with quality research on the position, the company, and your worth. And don’t be afraid to ask for what you’re worth. It can be a rewarding experience when you get what you want. We want to hear your #1 tip on how you negotiated your salary, comment below!